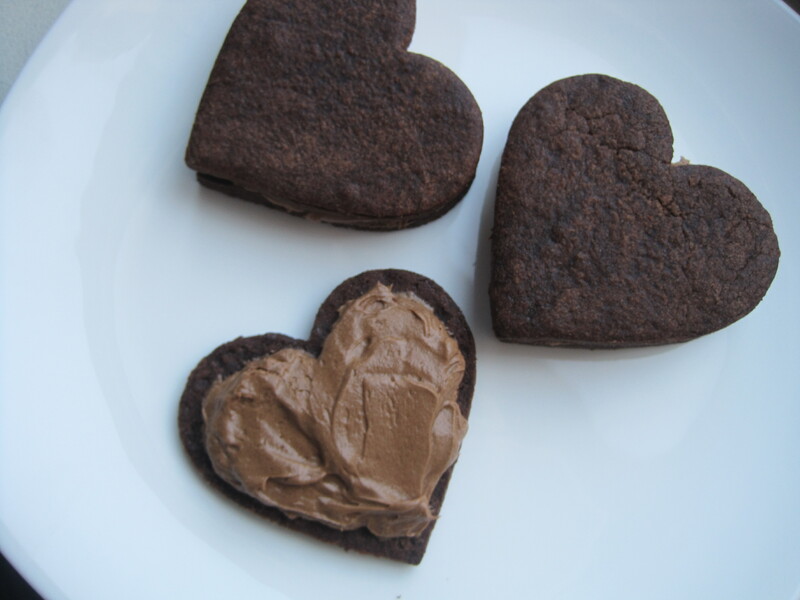 You didn’t think I’d leave you without chocolate on Valentine’s Day, did you? To make the cookies, first whisk together the flour, salt, baking powder and espresso powder in bowl and set aside. Using the paddle attachment, mix together the butter, sugar, eggs, vanilla and cocoa in mixer. Turn off the mixer and add the flour mixture, then mix until smooth. Wrap in plastic and chill for at least a half hour. Roll out cookie dough on floured counter or between sheets of parchment paper until it’s about 1/4-inch thick. 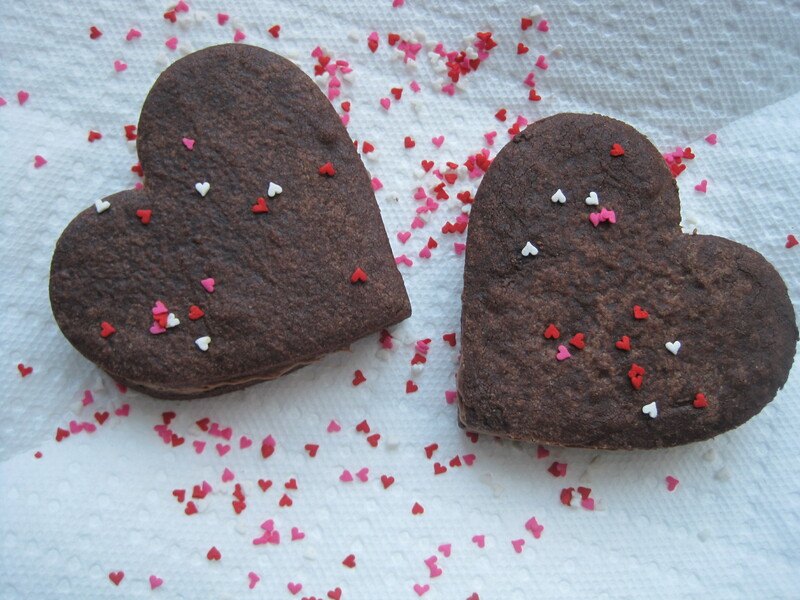 Use a cookie cutter to cut out large heart shapes from the dough. Bake on a parchment-lined baking sheet for 8 to 11 minutes, until the edges are firm and the centers are slightly soft and puffy. While the cookies are cooling, make the ganache by mixing the cream and espresso powder together in a saucepan until smooth. Heat the cream mixture until it just starts to bubble and simmer at the edges of the pan, then pour the hot cream over the chocolate in a medium bowl. Let the mixture sit for a minute, and then gently use a whisk to emulsify the ganache – it will look smooth and shiny. Let the ganache cool in the refrigerator for about an hour. Once cooled, but still a bit runny, transfer the ganache to the bowl of a mixer set with the whisk attachment. Whip the ganache until it has thickened and lightened in color (it will take about a minute or two) – it will look a bit like buttercream when it’s finished. Spread the ganache thickly on the flat side of half the cooled cookies, and top with the remaining cookies to form sandwiches. 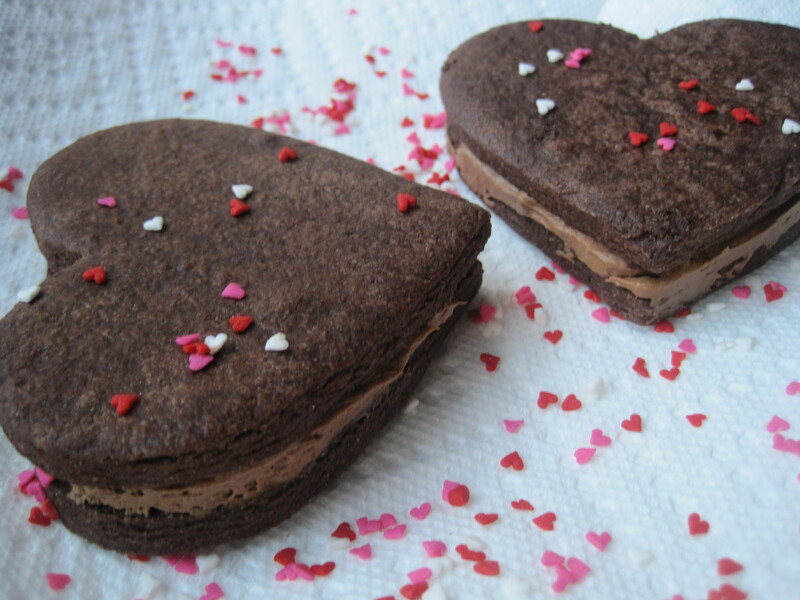 Serve with tall glasses of milk, and maybe a kiss for your Valentine. 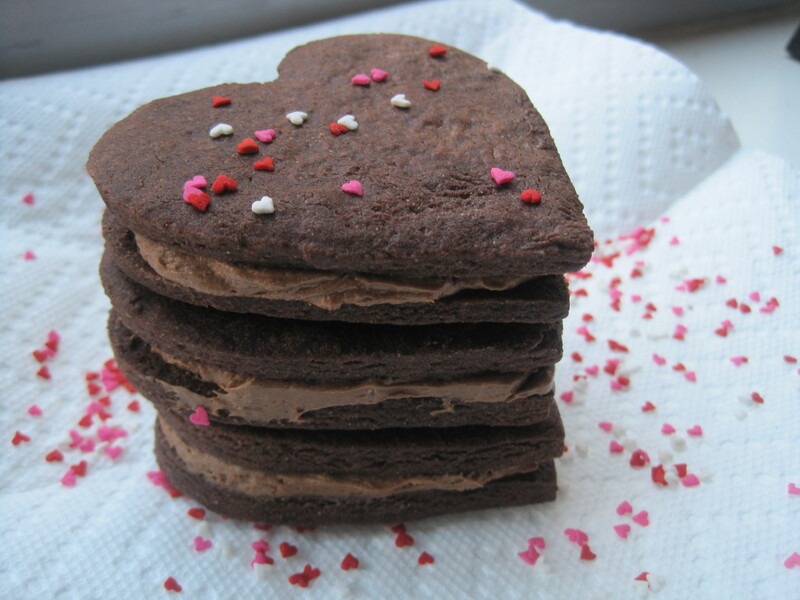 Makes approximately 25 sandwich cookies (depending on the size of your cookie cutter). sweet, sweet, sweet!! all of it!